Cancer research has traditionally explored tumor growth by focusing its experimental attentions on the genetically deranged cancer cells. Despite its simplifistic view, this focus has produced an extraordinary body of knowledge. A remarkable evolution in thinking about cancer has taken place over the past several years. It is increasingly apparent that tumors are complex ecologies of different cell types and that tumor growth and metastasis requires an appropriate support structure- the "tumor microenvironment". Thus, tumor microenvironment consisting of microvasculature (endothelial cells, pericytes, angioblasts and endothelial progenitor cells), fibroblasts, other stromal elements, and pro-inflammatory leukocytes, has emerged as important target in anti-cancer therapy. The evolution of cancer view. The field of cancer research has largely been guided by a reductionist focus on cancer cells and the genes within them (left picture). A remarkable evolution in thinking about cancer has taken place over the past several years. 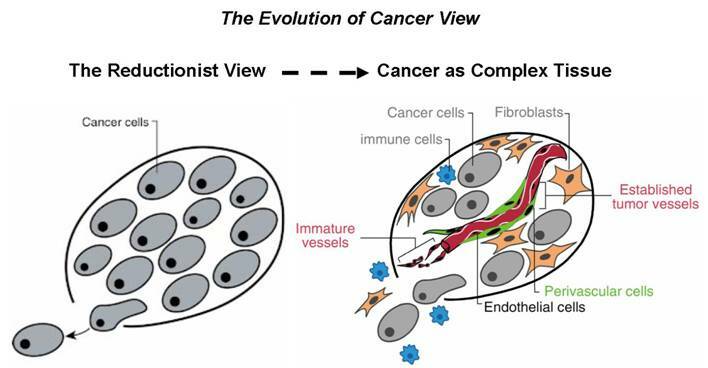 Right picture: the conceptual notion of tumors as aberrant organs composed of both cancer cells and conscripted normal cell types, all making functional contributions to tumor phenotypes. Figure is adapted from (Hanahan and Weinberg, 2000). Our interests lie in understanding the complex tumor-tumor microenvironment interaction and the genetic signaling interplays that drive the cancer and metastasis process. We have established innovative platforms to uncover the gene and protein signaling networks critical to the key regulatory processes in cancer development. Using these methods we were one of the first laboratories to systematically determine the genetic underpinnings of a process called 'angiogenesis', the generation of blood vessels by a tumor, on a genome wide scale. This type of investigation provides new insights into the nature of regulatory processes in homeostatic systems with important implications for the clinical practice.